Join us for a weekend of fun and excitement as we welcome you back home to celebrate Roeper’s 75th Anniversary! The weekend’s events will give you a chance to look at the many components of the continuance of life at The Roeper School. By coming home, it gives us time to think back to our school days and relive the history that George and Annemarie so richly embedded in our culture here at Roeper. Bring your significant other, bring your kids, and come for the entire weekend, or attend as many activities as you can! Please register by May 19. 10:30am, Roeper Parade LOCATION CHANGE!- Please note that the Roeper Parade in Downtown Detroit has been moved indoors due heavy rain and thunderstorms in the forecast. Alumni are welcome to join us for the indoor Parade to be held at Ultimate Soccer Arenas (Roeper’s Home Field) from 10:30am-12:00pm. Thank you for your flexibility! Ultimate Soccer Arenas is located at 867 South Blvd E, Pontiac. 7:00pm, George A. Roeper Festival of Senior Projects – In light of the 10th anniversary of the George A. Roeper Senior Projects, please join us in the Dean Acheson Theatre on the Birmingham Campus for the class of 2017 Senior Project Presentations. 11:00am-12:00pm, Welcome Home Lunch – Enjoy lunch on us at the Bloomfield Hills Campus, as we welcome you back “home”! 12:15-1:15pm, Bloomfield Hills Campus Tour – Tour the campus with our school historian while answering trivia questions to win Roeper 75th Anniversary memorabilia. 1:30-3:00pm, Coffee & Conversations – Geared towards adults and older children, these conversations will focus on gifted education and critical thinking, commitment to diversity, inclusion and social justice, philosophy of Arts Education, and Roeper’s interdisciplinary curriculum model. A Children’s Enrichment Program for ages 3-10 will be held in a separate area during this time. 3:15-4:15pm, Roeper Film Fest – Sit back, relax, and enjoy a compilation of clips highlighting The Roeper School and all of YOU, our alumni! This event will be held within the Children’s Library of the Bloomfield Hills Campus and popcorn will be served. 7:00-8:00pm, Reception and Tour of Birmingham Campus – Enjoy a tasty dessert as you tour the brand-new additions to the Middle/Upper School. The new spaces will feature a learning commons, library, and digital classroom. 8:00-9:30pm, A Night of Entertainment (for adults only) – To be held within the Dean Acheson Theatre of the Birmingham Campus, this night of alumni entertainment will include surprise performances from Roeper alumni! Childcare will be provided. 9:00-11:30am, Community Volunteer Project for families/Roeper Alumni Service Corps (RASC) – Choose to partake in one of two different volunteer projects on or off campus. On-Campus Service – As we celebrate Roeper’s 75th Anniversary, join us by helping to enrich our grounds by planting perennials around the Bloomfield Hills Campus. Off-Campus Service – Auntie Na’s House has been many things. It has served as a food pantry, after-school program, clothes distribution hub, community garden free childcare center, community meals space and temporary shelter. While volunteering here, we will be working outdoors in the community garden helping to beautify their outdoor space. Personal transportation required. 12:00-3:00pm, Roughrider Fun and Games – Enjoy games, prizes and a whole lotta fun for everyone! (This will take place within the gym and outdoor field located on the Bloomfield Hills campus). Food will be available for purchase between 12-1:30pm. The Roeper Spirit Shop will also be open between 12-3:00pm only. From T-shirts to jackets, lounge pants to yoga pants, sports bags to pillowcases, the Spirit Shop strives to help you wear your pride! 6:00-10:00pm, An Evening of Dinner & Dancing – Catch up with fellow Roeperians while enjoying dinner, dancing, and drinks within the historic Hill House. Childcare will be provided. 9:30-10:30am Farewell Breakfast – Complimentary continental breakfast on the Bloomfield Hills Campus. 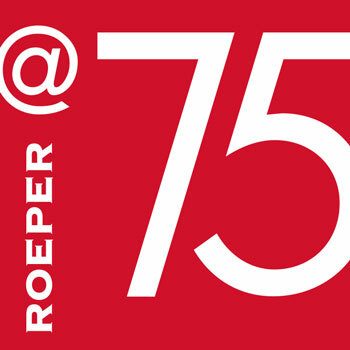 10:30am-12:00pm, Building Roeper’s Future – Learn about what we can we look forward to in the next 75 years at Roeper, and how you can continue to be a part of Roeper’s future. Whether or not you are able to attend the reunion, show your support with a gift to The Roeper School Annual Fund!